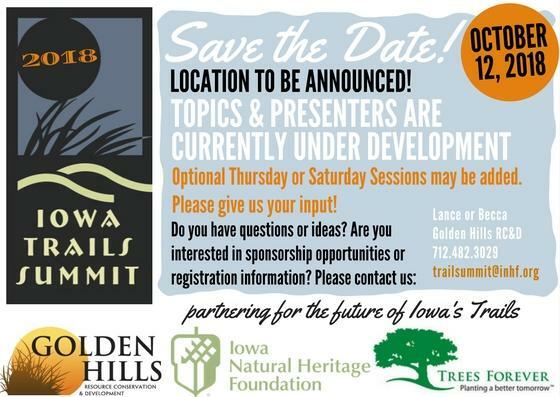 Golden Hills RC&D, Iowa Natural Heritage Foundation and Trees Forever are partnering to bring back the Iowa Trails Summit for 2018! Mark your calendar for Friday, October 12th! The Raccoon River Valley Trail Association will be hosting a social ride beginning at 5 PM Thursday evening, wrapping up with a pre-conference meet & greet! Our breakout panels will feature 3 tracks - for those who Want a Trail, Have a Trail, and Water Trails (more info coming soon). Want A Trail? Development and Fundraising. We will discuss overall development strategy and organizational structure and dig into what a successful trail group looks like. Representatives from public and private funding groups will highlight available programs, give advice on applications and documentation. Have A Trail? Maintenance and Stewardship. Established trail groups will talk about various approaches to volunteer involvement and management. We will discuss best practices and standards for partnerships on multi-jurisdictional trails. Innovative solutions, tools and resources for maintaining your trail will be discussed. We will come back together for lunch & our keynote speaker, who will be delivering an exciting national trails announcement! Want A Trail? Planning and Land Acquisition. What you need to know about land acquisition – legal and real estate considerations from seemingly straightforward rail-trails to working with multiple private landowners to create a corridor. Discuss ways to phase a project to break it into manageable chunks, obtain cost estimates, and work with engineers and funding sources to stay within their guidelines. Have A Trail? Marketing and Promotion. If you build it they will come – maybe. How to effectively brand and promote your trail, even on a minimal budget. Event building strategies from statewide experts to create an experience that will keep people coming back for more. We will wrap up our day with a Vision Forward for Iowa! Review content covered in breakout sessions and address questions that were unanswered or raised throughout the day. Set up a network for future collaboration, and build relationships to work together as advocates for Iowa’s vision moving forward. 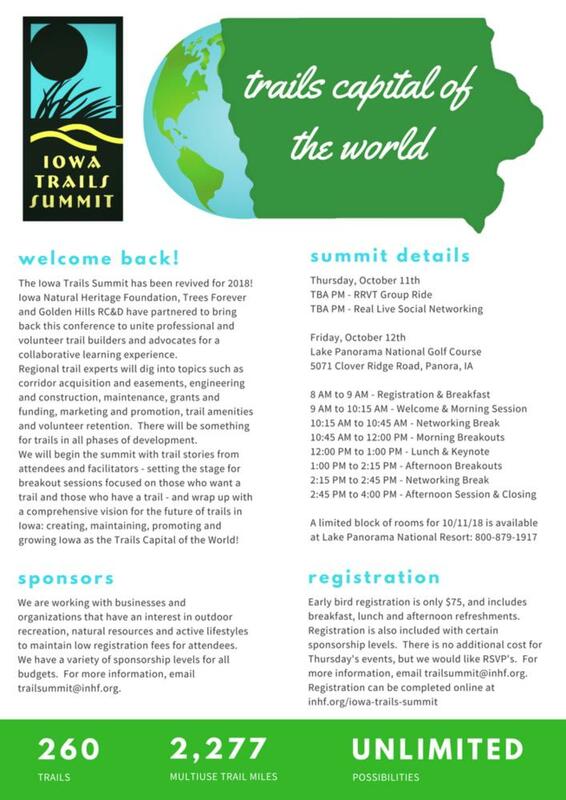 We have many sponsorship opportunities available - so contact us if you would like more information about how you can play a part in making the summit possible!